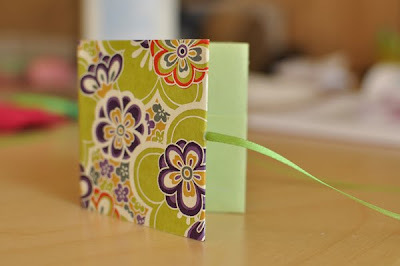 I made this little book. It's a "Single-page book with pockets" from Alisa Golden's fantastic how-to, Unique Handmade Books. The "single-page" part of the book's name refers to the fact that all of the pages come from one letter-sized sheet of paper, which has been folded, cut in places, then glued together. The only additional piece of paper required is the pretty stuff for the cover. I added an embellishment of my own by gluing a ribbon beneath the cover page. I figured that I'd probably fill the pockets beyond capacity and then I'd need something to hold the book shut. Once I had the hang of it, I made two more books. And now I'm a little stumped. What shall I put inside the pockets? I made a few little trinkets, but neither of them is screaming, "put me in a little book with pockets!" So, I'm still thinking about it. 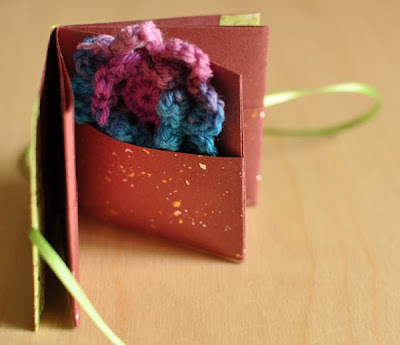 What special little something would you put inside one of the pockets? what a beauty! i love it! 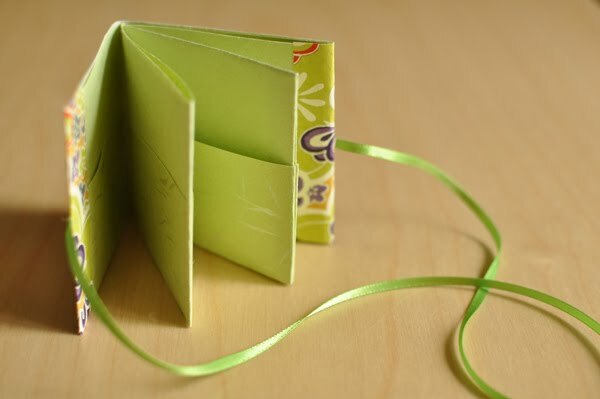 i'd put little fortunes, wishes, or notes in the pages! A++++ Lovely! 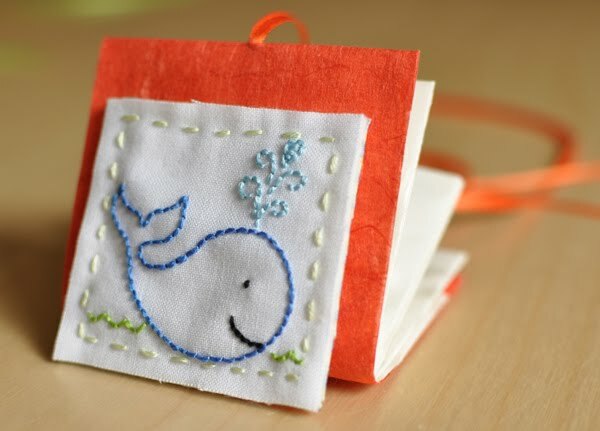 Actually, I think the whale does say put me in the little book with pockets. :o) A little bookmark made out of some more of your lovely paper, a paper flower (oh...can you origami? I can't but a menagerie of paper friends could be fun to store in your little pocket book), paper clip (plain or fancy), love note or a coin might like to join the whale. 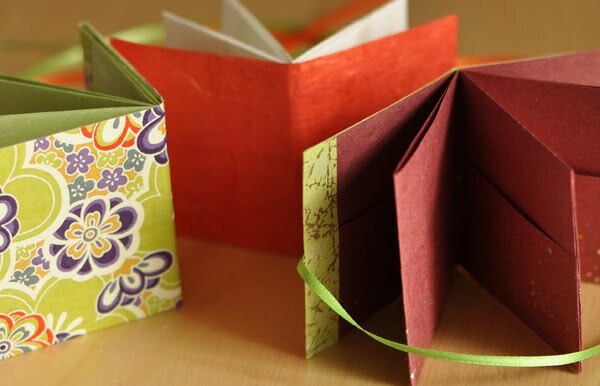 Christie these are beautiful little pocket books! Thanks Aimee, Scribbler and Liberty! So many good ideas! As soon as I fill the pockets, I'll post an update. Oh - wow - this is so beautiful! I love it! And what a coincidence. I recently bought (not made, but bought!) two tiny little books which I was going to use as a model for making books. I'd love to link to your post when I eventually blog about it, if I may! Thanks, Christine! By all means, link away! I think it should be based on who its for or an event. My first thought was: a locket of hair. most people put them in scrapbooks and i just want to feel it. I think it would be wonderful to feel my great grandmothers hair and compare it to mine. Those little school pictures that kids share would be fun in there! Or old movie tickets! my daughter chloe suggests keeping paper doll clothes in the pockets. she has a "klutz" book of paper dolls/outfit designs that she uses almost daily to make paper clothes out of scrapbook paper. 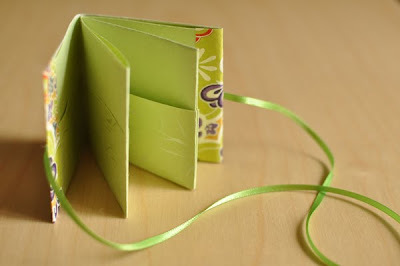 I'm going to make one and use it as a guest book for my parent's 50 anniversary party. I'll give everyone a small-ish piece of paper to write a note to them on, and we'll keep the notes in the book. Yeah? I think it will be just right. Thanks, Laylablue! Paper dolls would be such fun to put in the pockets. Thanks, Sonja! What a lovely idea for a touching keepsake. Best wishes for a wonderful party! I love the little book. I think I'd put in some inspirational quote, maybe stamp something like flowers or whatever. This would make a great gift to a friend who needed a lift. 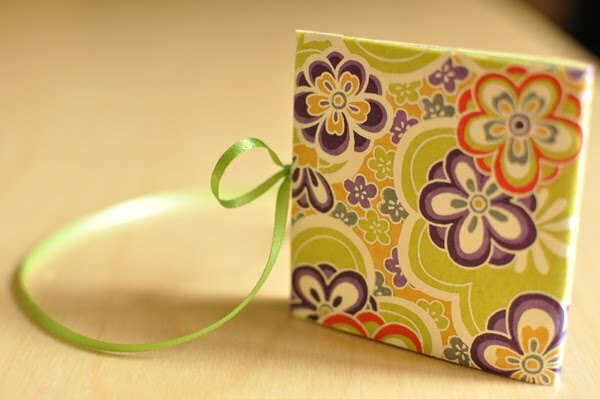 A gift card would be nice, plus coupons for his/her favorite store; tickets to a movie or concert, a bookmark, inspirational messages; coupons for some treat or activity, etc. A few quick and easy recipes; a couple of teabags and sugar/sweetener packets and a few aspirin for moving day headaches! Name, addresses and phone numbers and photos of nearest neighbors for a new resident in your neighborhood; names and numbers of babysitters or other items likely to be needed by a new resident. Perhaps they could be "redeemable" for a cup of coffee/tea, a cookie or some other goodie to welcome someone. What a nice little book! I'll make these for sure - thanks!